Forgive me for not posting lately. Between Birthday week (yup I turned 45) and recovering from another cold, there has been not much room to get out side to complete any proper walks. So, after being sick all weekend, I finally got back to work on Tuesday. With the non-stop rain, Shirley and I did our Tuesday & Wednesday daily walks on S5 of the parking garage. While not terribly scenic, there are a few classic cars and a couple jeeps that we get to see. Shirley’s favorite is the corvair and a red fast back mustang. Today the clouds cleared and the breezes were fine. So we did the big hills over to the park by Quality Hill. An extra loop around one other building gave us another hill back in the other direction. Today’s picture is on the tail end of our walk going East on 12th street. I am standing next to the KC Southern building. On the left (red brick) is the Marriott. Center foreground is Bartle Hall loading dock and the square glass building is our office. 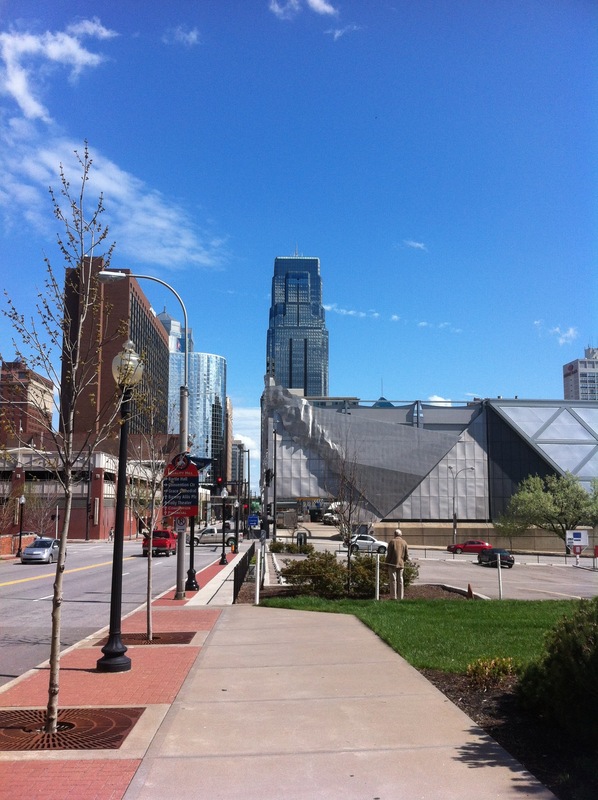 This entry was posted in 2012 Challenge, Workouts and tagged Bartle Hall, KC Southern, Quality Hill, walking by julia. Bookmark the permalink.